In a previous post we explored the doctor-patient relationship, which according to many is an important factor influencing the health care trifecta of quality, outcomes and cost. So far the doctor-patient relationship escaped rigorous quantification, because “relationship” is largely a nostalgic quantity, and because “communications” was deemed to be a reasonable substitute. There are various tools and instruments for subjective measurement of communications with one’s doctor, with the most common being the ubiquitous patient experience survey. 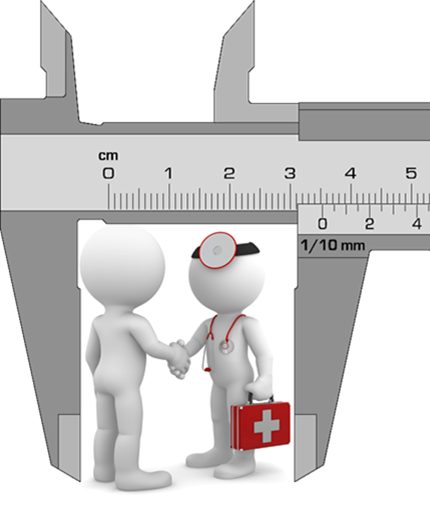 However, if we accept a broader definition of the doctor-patient relationship, such as the 6C’s proposed by Dr. Emanuel, a more objective measurement of the relationship seems not only possible, but desirable even for those who may be questioning the value and purpose of quantification in general, and obsessive measurement in particular, present company included. Let’s take the 6C’s from the top, leaving out communications and compassion, which are subjective quantities. The intent is to create an accurate picture of relationships patients can expect to have with a physician within the boundaries imposed by their financial circumstances. Most suggestions presented here are not attempting to score the physician directly, since relationships are always affected by more than just intrinsic qualities of the two parties relating to each other. For example, a relationship with the most compassionate and articulate physician may turn into a disastrous affair if conflicts of interest dictate how communications are conducted and how and when compassion is expressed. Ideally, a patient specific “scorecard” composed of the criteria below, would be compiled by a non-biased third party, or by physicians themselves, and made available to patients. For patients, this means choice of practice type and settings, primary care physician, specialists, hospitals, and choice among treatment alternatives. Surely the degree to which these choices are available to patients can be objectively calculated, rated and ranked as is now fashionable. For example, where patients are assigned to physicians by third parties, the relationship would score a big fat zero. A point or two would be awarded to a vertically integrated system where patients can choose from the physicians employed by the group. Scores would be proportional to network size and variability for more traditional plans, with Medicare fee-for-service and cash-only practices getting the highest scores. Obviously, patients will need to account for individual scenarios for incrementing or decrementing scores. Choice of specialists and hospitals can be inferred from the same variables as measured above, but adjustments will need to be made to account for hospital privileges and referral patterns of the primary care physician. This too can be measured and scored pretty accurately from easily obtainable hard data. Choice among treatment alternatives is a bit trickier, particularly in primary care. Using process measures, sample documentation and insurance plan policies, one could derive an individualized measure of choices available to patients. It is important to note that here we are not measuring “appropriateness”, “stewardship of scarce resources” or how “wisely” people choose, nor do we measure “education” about options. We measure the actual availability of treatment options. How does one measure physician competence? Arguably, all current “quality” measures, public reporting and board certifications are aiming to quantify and ensure precisely the competence of doctors, in a roundabout way that is failing to measure anything of consequence. If we describe a competent physician as one who stays up to date, has good technical and diagnostic skills, exhibits good clinical judgement and is cognizant of his or her own limitations (as Dr. Emanuel did), we could devise better ways to assess competence. Staying up to date is trivial to measure. Technical and diagnostic skills, as well as clinical judgement, are very difficult to assess objectively, and perhaps this is why all our faux measuring schemes seem woefully inadequate. We can certainly envision physicians assessed by their peers (perhaps anonymously or through virtual grand rounds collaboratives), but competence cannot be discussed until we quantify the prerequisite time variable. It makes little difference whether a physician is competent or not, if the patient rarely sees the doctor, or if visits are limited to a few minutes of furious typing, clicking and scrolling. So here is one variable that can be objectively and rather easily quantified: time spent with patients by severity of chief complaint, patient health status and vulnerability. We can get fancy and measure frequency of visits and total time spent per patient per year, adjusted for a host of variables. Another factor closely related to competence in primary care, and not explicitly addressed by the 6C’s framework, is comprehensiveness. This too can be measured objectively. The range of conditions treated by the physician, and the list of those routinely referred out can be compiled, ranked and assigned relative scores accounting for frequency of occurrence, along with patient characteristics. For example, a physician treating large numbers of elderly diabetics with multiple comorbidities, would garner more competence points than a physician who spends most of his time taking telemedicine calls for minor and limited ailments. A physician who admits and manages her own patients when hospitalized would rank higher than physicians who never set foot in a hospital. Continuity of care is another word for long lasting, comprehensive relationships, and it can be accurately quantified with very little effort. Both PCMH and standard patient experience surveys include vague attempts to quantify continuity, but those could be misleading. Continuity of care is now applied loosely to teams of clinicians, such as residency groups, and it does not account for how appointments are conducted. When the patient is seen by a team member, and the billing doctor sticks his head in for a few seconds to say hello, does this count as continuity? When any and all patient interactions that do not involve a face-to-face visit are “handled” by other team members, and never the physician, does that count as continuity? How about outsourcing complex care management in between visits altogether, which is the “unintended” consequence of the new Medicare chronic care management fee? It is important not to confuse continuity of care with continuity of medical records, or care coordination, when quantifying this aspect of the doctor-patient relationship, but other than that this may be the easiest factor to quantify objectively. A physician who always sees his or her patients, is always available in between visits to provide clinical advice, and has maintained this relationship with individual patients over long periods of time, would score high on this factor. Almost by definition, solo practitioners and many direct primary care physicians should top the charts on continuity. Similar to the quantification of patient choice, here too we must account for the vagaries of health insurance marketplaces which are increasingly empowered to break any relationship at any time on a whim. This is arguably the most important factor in the doctor-patient relationship, and other than random incendiary headlines, there are no serious attempts to measure or even shed light on the mushrooming conflicts of interest systematically inserted into the traditional doctor-patient relationship. Ideally, physicians would always act solely in the best interest of the one patient in front of them. Most people still believe that this is the case and most physicians will insists that regardless of circumstances, this is what they strive to do, but there are objective data points that could more precisely quantify the alignment of interests between doctors and patients. We all know now that accepting the smallest gifts from pharmaceutical companies represents a conflict of interest. But how about directly tying salaries, and other compensation for labor, to corporate revenues? How about enforcement of corporate protocols and suppression of “disruptive” behavior? How do these things jive with the clinical judgement required by our “competence” factor? How about coercive “reimbursement” rates that force physicians to limit time spent with patients, and exclude certain patients from their practice? How about participation in incentive programs that pay doctors to substitute the interests of “society” for the individual interests of patients (as “misguided” and “wasteful” as those may be)? These are precisely quantifiable data. Ideally, I would love to see a comprehensive, and frequently updated, list of all potential conflicts of interests for each physician, by health insurance plan, publicly displayed in every practice and on every practice website. Why? Because conflict of interest, whether by choice or externally imposed, affects the most basic ingredient of any relationship: trust. If you were charged with a crime, would you trust a lawyer who is payed to keep society safe from criminals? Would you trust an accountant who is paid to increase IRS revenues? Would you trust a hair dresser paid a fixed fee per client per year? Would you trust a mechanic who gets a little kickback from your insurance company to use the cheapest replacement parts for your car? Same goes for doctors. In summary, there is absolutely no reason why we should not collect objective data, which is readily available in quantifiable formats, and combine it to create an informative picture of each physician and the environment in which he or she is practicing medicine. We may not be able to come up with a simplistic single score on some artificial scale, and we may not be able to punish or reward doctors for the “relationship measure", but people have a right to know what lies behind studied communications and standardized compassion, and most of all, people have a right to know how health care reforms are affecting a physician’s ability to maintain relationships with patients. If I’m not mistaken, this is what transparency is all about.